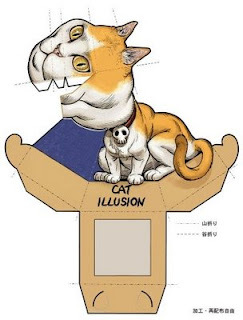 Just to give cat loving papercrafters equal opportunity with robot dog and dragon loving papercrafters, here is a cat illusion papercraft. ^_^ Just like the Super Robot Dog I posted yesterday, if constructed correctly this kitty's eyes and head will appear to follow you around the room as you move. I like to give credit where credit is due, but I was unable to find out who created this one. Perhaps the text at the bottom of the template would provide a clue if I could find someone to translate it for me. 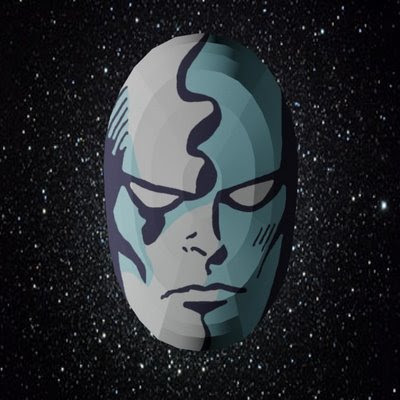 A copy of the template can be found at /po/ Archives Papercraft and Origami Database. This robot dog is a new take on the optical illusion dragon papercraft that you may have seen. Illusion papercraft such as this are constructed in such a way that as you move about the room the head and eyes appear to follow you. 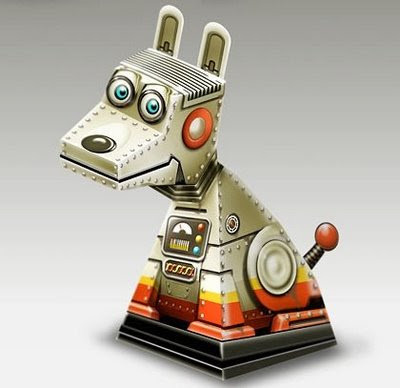 Entitled "Super Robot: Dog Version", this papercraft was designed by graphic designer Tanarat Ruamwang, Thailand, 2008. Both the template for the robot dog and a blank template to create your own illusion papercraft are available at Ruamwang's blog here. Well, it's not made out of paper, but it's close. 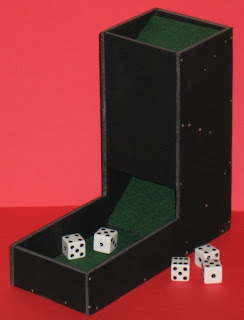 At Instructables.com I found instructions on how to build a dice tower and decided to make one for myself. This particular tower is constructed using black foamcore, toothpicks, self-adhesive felt, and some glue. I didn't follow the instructions exactly. For one, I thought it looked nice enough without spray painting the whole thing as the original designer did. Also for quieter use, I applied felt to all the baffles inside the tower and not only to the tray at the bottom. Easy to follow instructions and a short video of the tower in action may be found here. 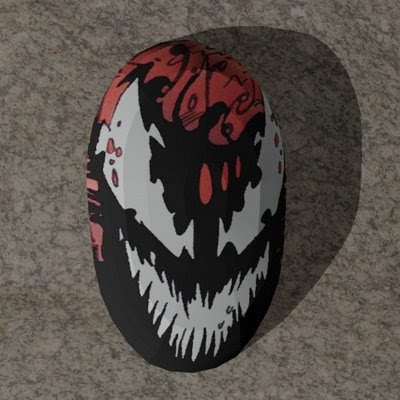 One thing I did different with this mask compared to previous masks is that I put the texture of the mask on the optional back cover of the mask rather than leaving the back cover blank. That way the back cover of the full size mask is almost large enough to be used as a flat mask by itself. 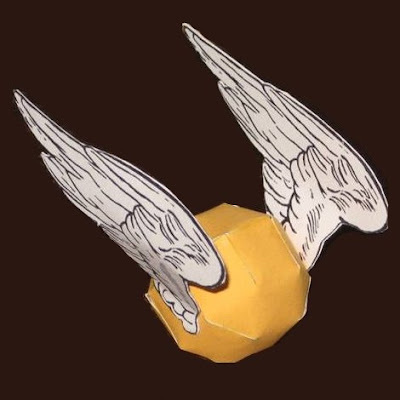 As any Harry Potter fan knows, the Golden Snitch is magical winged orb used in the flying broomstick game of Quidditch. In the book Harry Potter and the Philosopher's Stone, Harry wins a Quidditch match by catching the Golden Snitch in his mouth. 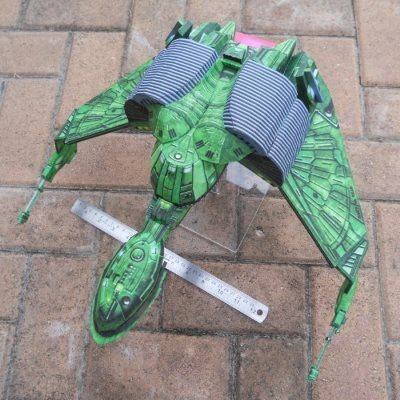 This papercraft version of the Snitch was designed by UK papercrafter Mark Green (a.k.a. paperart) as a gift for his nephew. The template, which includes a display stand, is available here. 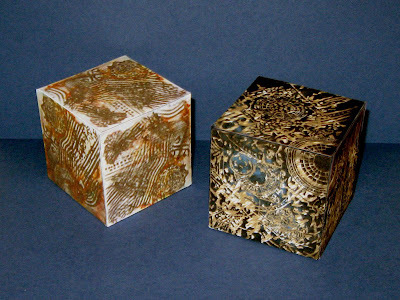 For being Jonathan Sheppard's first attempt at papercraft design, I think he did an excellent job. 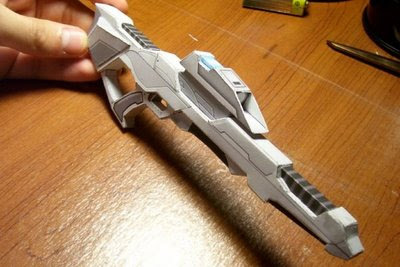 This 8" (20 cm) long papercraft phaser rifle was modeled after the version of the weapon that appears in the video game Star Trek Voyager: Elite Force and the movie Star Trek: First Contact. A PDF template of the rifle is available from Sheppard's deviantArt page here. 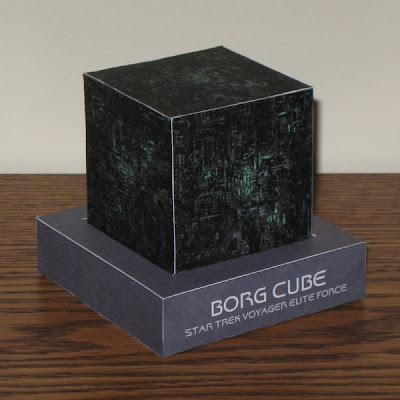 I have been itching to try my hand at creating some papercraft from 3D models ripped from video games and since I do have a copy of Elite Force... be on the lookout for some Star Trek papercraft of my own in coming weeks. 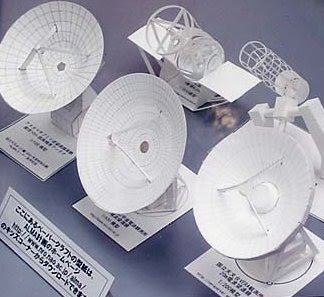 These detailed papercraft telescopes were designed and built by staff at the National Astronomical Observatory of Japan. The models in the front row are radio telescopes. In the second row are infrared and optical telescope models. Templates for each of these along with a couple of satellite templates are available at the NAOJ's ALMA website. Other: templates with both lines and no lines are included in the zip file. 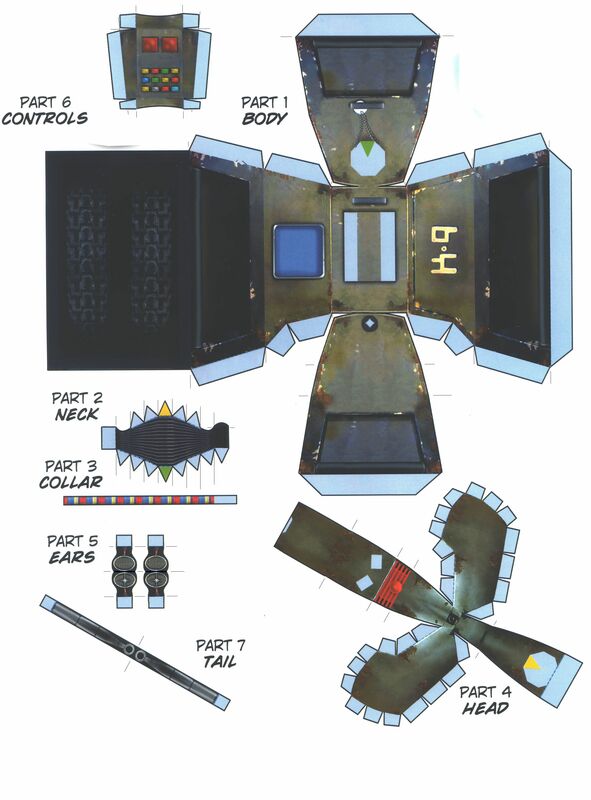 The template for this K9 robot dog paper model originally appeared in issue #3 of Doctor Who Adventures Magazine. 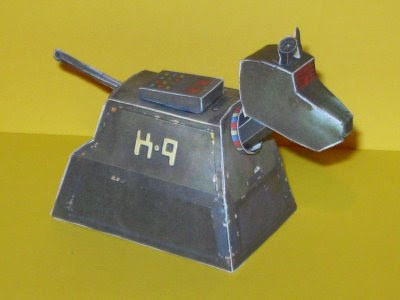 I built the above K9 from a template scan by UK Doctor Who fan, Sean Huxter. In order to create a cleaner looking finished model, Huxter modified the original magazine template by erasing the dashed fold lines. A JPG image of the modified template is available on Huxter's website here. DeviantART user "Cyberdrone" has taken the free blank Cubeecraft template and created a collection of 30 custom Star Wars papercraft toys. As far as I know, each of these is an original creation which has not been posted in the official Cubeecraft gallery. Some of the other characters available but not pictured above include Count Dooku, Ashoka Tano, Kit Fisto, IG-88, Jango Fett, Mace Windu, Darth Nihilus, a Jawa, and a gonk droid. Templates for these and many more can be found here. Recognize these? 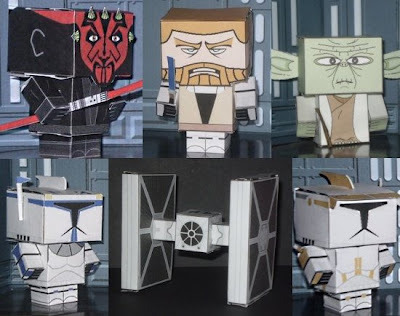 Each one of these paper toy characters is based on a different cube seen in video games. From left to right, we have the Question Box from Mario games, the Weighted Companion Cube from Portal and finally the Sascha Nein Mind from Psychonauts. These paper toys are the creation of art student Heinze Havinga, Netherlands, 2007 in celebration of the great outcome of his exams that year. The templates for the toys may be downloaded here. 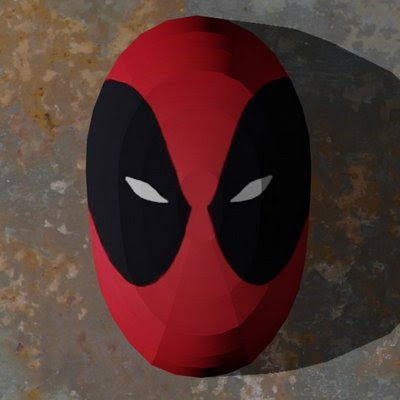 I am not sure how far I will be able to take this mask series as not just any character will look right with the shape of the mask, but I have at least four more characters in mind that I think will work. I also originally thought I would do only Marvel Comics characters, but have since thought of a couple of non-Marvel characters I would like to try as well. A couple of weeks ago I did a post on a papercraft trilobite. However, I am much more impressed with this origami trilobite designed and folded by Sipho Mabona in 2008. 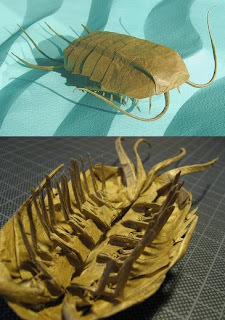 The trilobite was wet folded from a single 24.4" (62 cm) square of paper. The level of detail of the legs on the underside is truly amazing. I don't think I have the time or the patience to attempt one of these myself, but if you would like to try, Mabona has provided a folding template here. Mabona also has done some other incredible origami animals as well which can be seen in his flickr gallery here. These fanciful monsters are what UK illustrator Jennifer Bryan calls "Creaturekebabs". On her website, Jennifer offers a unique line of artwork and products based on her Creaturekebab characters. 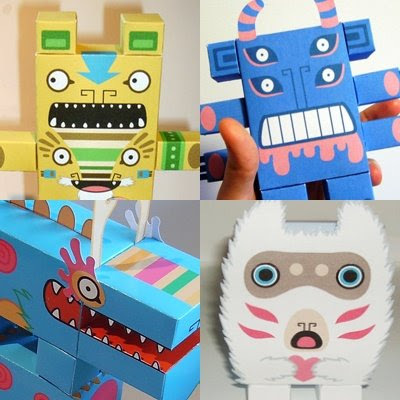 These four papercraft versions of her monsters are available as free downloads. There are no instructions included with the .jpg templates, but hey, figuring out how to build them is half the fun. Send Jennifer a build photo of one of these and you just might win a prize. You can grab the templates at the bottom of the page here.